We reported on the Rattenclub Berlin-Brandenburg once before, but didn’t have much information. 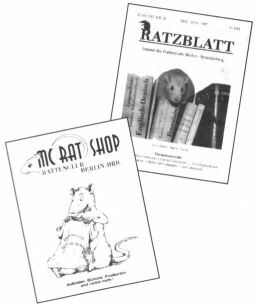 Christiane Frost has sent us a copy of their publication, Ratzblatt, which is published in German, and a copy of Mc Rat Shop, a catalog full of rat merchandise that is a must for every rat lover! The catalog is also published in German, but I’m sure you could get someone from there to translate dialogue and prices for you if you order from them. The catalog contains several different stickers, bookmarks, buttons, stationery, a beautiful medallion, T-Shirts, sweatshirts, postcards, and lots, lots more! She also sent us the beautiful drawing above and many, many fantastic photos, some of which I’ve used in this issue, but there are so many great shots they’ll be appearing in several issues to come! We will also be receiving much more from their many talented members. They would like to exchange views, ideas, and information with other fanciers world wide and keep their membership up on what is going on around the world regarding rats, so let’s try to make this a true exchange, members - please send in a submission for the Gazette and include something for the Rattenclub Berlin-Brandenburg!